September marks the start of football season, and also the best time to overseed cool season lawns such as fescue and bluegrass. The soil is still warm and there’s usually plenty of rain. This gives newly planted seeds a good opportunity to establish the strong root system that they will need to survive the winter. Early fall is the best time to start overseeding cool season lawns to establish a strong root system that will survive the winter. Mow existing grass low. Prepare your lawn by mowing your grass to about 1” in height. A few weeks before seeding, use a broadleaf weed killer. Remove any rocks or other debris. These steps will enable seeds to reach the soil. And your new seedlings will get plenty of sunlight and nutrients, without competing with grass and weeds. Test the soil. The pH should be between 6.0 and 7.0. Add lime to raise a low pH; add sulfur to lower a high pH. Aerate the area. Aerating creates holes for seeds to germinate, and maximizes your seed coverage rate. To make this step easier, water your lawn a day or two beforehand. Even lawns that don’t need overseeding will benefit from aerating once or twice a year. Apply starter fertilizer. This will help your new grass seeds to grow faster and thicker. Buy clean seed! Look for “0% weeds, 0% other crop” on label. Always use the freshest seed available. Nurseries can provide that information for their bulk seed. Or check the expiration date on the label of prepackaged seed. Broadcast seed at 4 to 6 pounds per 1000 square feet. Be careful not to apply too much seed. That can overcrowd and kill the seeds. It may also lead to fungal diseases. Because seeds are so lightweight, a drop spreader works better than a rotary spreader. To get the most even distribution, spread half of the seed while walking back and forth in one direction. Then spread the other half while walking at a right angle relative to the first sowing. Rake lightly afterwards to ensure good seed/soil contact. 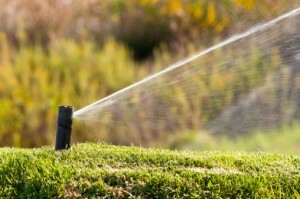 Irrigate consistently and evenly to keep soil moist and allow for seed germination. Keep soil consistently and evenly moist for seed germination. Irrigate the area a couple times a day for the first two weeks. You may need more water to keep the top ½ to 1 inch of soil moist. As the seedlings develop, you can taper off the watering. Just make sure the soil doesn’t dry out completely or the seedlings will die. Add a quality, pH-neutral compost. You need an inch or two at most. Mow when the seedlings reach about 3 inches. A sharp blade is crucial because the seedlings are tender and can be easily damaged. Cut the grass to two inches high. Continue weekly mowing until the grass goes dormant. Dormancy happens when the overnight temperatures get close to freezing. If you have thinning areas, but still more than 50 percent healthy turf, overseeding will help your lawn to emerge stronger in the spring.